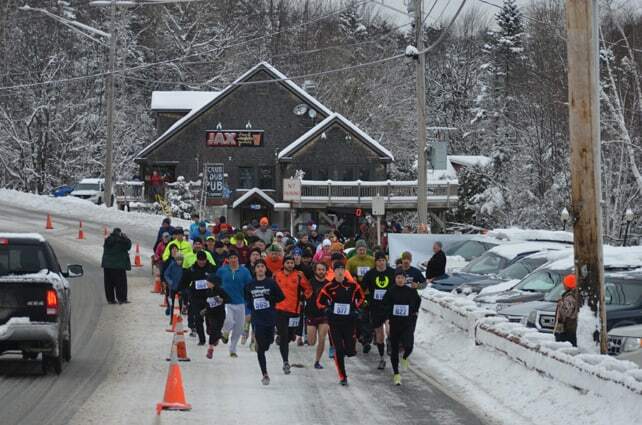 KILLINGTON — The fourth annual Killington 5K Turkey Trot was a great success, said event organizers Kasie and Jamie Munson. “Our goal is to bring the community and out-of-towners together,” said Kasie Munson. Last year, she heard that a couple from out-of-state met a ski instructor who had no family in Killington, and brought him home to share their Thanksgiving feast with him — a perfect example of togetherness! The Turkey Trot began in 2011, to help raise money for the “K-TOWN Irene Island Fund.” The event has grown in participants every year and the Munson’s pick local charities, to which to give 100 percent of the proceeds from the race. This year’s main beneficiary was local Cub Scout Pack 220. The money is raised from the registration fees, t-shirt sales and raffles. For the Munson’s, the event has become a true family tradition. Jamie’s father, Ken Munson, was at the half way point; handing out water to the participants, while blasting music from the sound track to “Rocky.” Son, Cooper Munson, donned a turkey costume as he ran, and daughter Chandler Munson helped her dad encourage runners with a mega-phone as they approached the finish line. Trophies were given to the top male and female runners. This year, Ben Girard was the first to cross the finish line. He is a member of Castleton College’s cross-country team. He clocked an impressive time of 17:59, especially considering the road conditions after receiving nearly a foot of snow the pervious night. The first woman across the line was Christie King, who recently joined the Killington community to work as a snowboard instructor. She came from Florida. “It has been a few years” since she ran her last 5K race, she said. Woody was the first four-legged participant to cross the line. Local businesses donated prizes for the teacup style raffle after the race and Daniel Brown entertained with his guitar and vocals.